Chances are you’ve probably seen a captive portal before. If you have been to a coffee shop, hotel lobby, library, etc. and saw the log on page for wireless guest access you’ve seen a “captive portal”. Essentially a captive portal is a pretty basic looking web page that the user of a guest access network is required to view and interact with before access is granted. Captive portals are typically used by businesses, airports, hotel lobbies, coffee shops, restaurants, libraries, retail locations, and other locations that offer free Wi-Fi. A simple captive portal requires the user to at least look at (if not read) an acceptable use policy page, and then click on a button indicating agreement to the terms of the policy. Presumably, this can help clear the provider from liability in the event the user commits criminal or other damaging activity while logged on to their network. However, some have taken captive portal to a whole other level. Along with the basic description provided above, captive portal can be utilized a lot more effectively now. There are some really important things that page does if you’re the one offering free wireless access for visitors and guests. 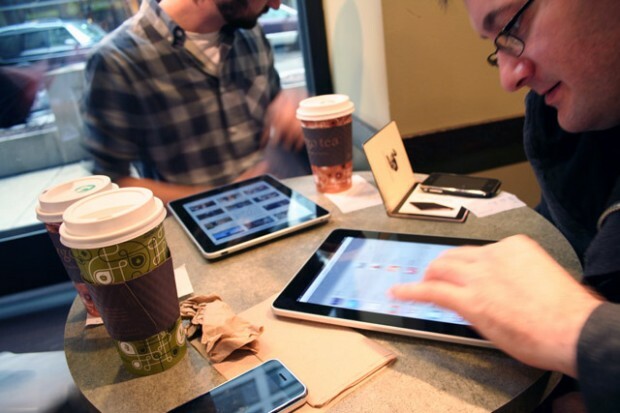 Your captive portal for wireless guest access should include these 7 features. Here guests and employees can register for guest access to the network through a customizable web interface. There is already a pre-defined security policy so there is no IT involvement. Users just put in their name, email, and any other customizable fields to capture demographics. Another cool thing you can do is have integrated SMS delivery so that if you are a retailer, after you grant them access an advertisement like a discount or coupon code is automatically sent. Based on the demographic you had them fill in you can deliver more targeted content as well. This is where the user trying to get guest access registers their device for access to the network saying that for example John Hancock the company COO is his “sponsor” (the authorized person granting him access to the network). Then a message is automatically sent to John Hancock the company COO asking him to grant that user access. John grants it and the access credentials are sent to the user via text message or email and voila that sponsored user can now login and access the network. This is perfect for if you know you have a bunch of visitors coming for a meeting, conference, etc. and you know they will want to access the network. You can have the ability to bulk import the guest list in XML, CSV, TSV, or plain text ahead of time. You can then assign roles, expiration times, user names, and passwords so when the users arrive and login they automatically have guest access granted to them. You can set up notifications through email or SMS to grant people access as I stated above to simplify registration. IT will be swamped with request if it only allows IT sponsors. Your captive portal needs to allow others in the company as well like John Hancock from number 2 to grant access. Captive portal should give you the ability to set day and time limits to the guest access so that they automatically expire after a certain amount of time. You don’t want to just send someone a password and give them indefinite access, because they can then login whenever they want and give it to others as well. It must track and report guest account activity as well as employees that are sponsoring each guest.You can get default usage and trending reports along with customized reports to meet unique customer requirements. 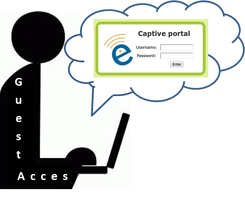 Contact us here to learn more about captive portal and secure wireless guest access. At SecurEdge we’ve been designing and deploying secure wireless network infrastructures all across the US for a long time and are always more than happy to help and answer any of your questions. Check out our free wireless design kit too for some more good information. Our goal is to be a resource for you.